Many important diseases of humans, domestic animals, and wildlife are pathogens that infect multiple host species. Understanding how and why anthropogenic environmental change (land use and climate change) influences multi-host pathogen transmission is important to infectious disease prediction, prevention, and control. Our laboratory integrates theoretical (statistical and mathematical models, ecological narrative) and applied (molecular blood meal analysis, community ecology field studies) approaches to understand the ecology of multi-host pathogens within the context of anthropogenic environmental change. We are particularly interested in how alterations in host and vector community structure, food web structure and function, host life history, and vector microenvironments induced by environmental change influence pathogen transmission, persistence, and evolution. Our study systems include Chagas disease (Trypanosoma cruzi) and cutaneous leishmaniasis in Panama. We work in close collaboration with Parasitology department of the Instituto Conmemorativo Gorgas de Estudios de la Salud-ICGES (led by Dr. Jose Calzada and Dr. Azael Saldaña), Dr. Luis Fernando Chaves of the Tropical and Emerging Communicable Diseases program at Nagasaki University, and Dr. Allen Herre of the Smithsonian Tropical Research Institute. Our research has shown that deforestation is associated with increased transmission (increased vector abundance and vector infection prevalence) of the Chagas disease parasite Trypanosoma cruzi in Panama) (Gottdenker et al. 2011, Am. J. Trop. Med Hyg., Gottdenker et al., 2012, PlosNTDS). We have long-term studies on the ecology of Chagas disease vectors, and recently studied the flight performance of the Chagas disease vector Rhodnius pallescens using a flight mill experiment (Castro et al. 2014. Journal of Medical Entomology). We are using data from this study to investigate a source-sink network model of T. cruzi transmission in vectors inhabiting Attalean butyracea palms. Current research includes a SENACYT-funded project in collaboration with the Parasitology Department of the Gorgas Institute on the impact of forest fragmentation on the ecology of Chagas disease and cutaneous leishmaniasis in two rural communities to the west of the Panama Canal. We are studying vector and wild reservoir host populations in intact (Gigante) and deforested rural landscapes. We are also studying trypanosome and leishmania transmission in two and three-toed sloths in collaboration with Dr. Diorene Smith of the Summit Zoo and the Gorgas Institute. Because understanding, prediction, prevention and control of neglected tropical diseases require a multidisciplinary approach, we are also interested in holistic studies of zoonotic diseases: incorporating ecological, evolutionary, economic, and social science approaches to understand, predict, and prevent disease transmission. We (Julie Velasquez-Runk, Susan Tanner, and collaborators from the CDC , Gorgas, and UGA) recently received seed funds from the Centers for Disease Control and the University of Georgia to work in Panama on integrating anthropology, ecoepidemiology, and veterinary science to define drivers of vector-borne zoonotic disease transmission. In this research, we use dogs as sentinels for Chagas and leishmania transmission risk in humans. This project is a collaborative effort between disease ecologists, anthropologists, epidemiologists, medical geographers and spatial analysis experts from the CDC's GRASP program, and disease experts at the Gorgas Research Institute. We are involved in studies advancing novel techniques in molecular diagnostics of vector-borne pathogens. Currently, we are collaborating on a UGA funded One Health project with Dr. Travis Glenn on using next-generation sequencing to simultaneously detect pathogens in Chagas disease vectors and identify species from which vectors are feeding by blood meal analysis. Additional projects relating to tropical zoonotic disease research include a recent preliminary study on the ecology of Chagas disease vectors inhabiting palm trees across deforestation gradients in lowland Bolivian Amazon in collaboration with Simone Frédérique Brenièreof the IRD in Montpellier, France and Rocio Buitrago and Susanna Revollo of the Universidad Mayor de San Andres. We are also interested in understanding the impacts of parasites and pathogens on wildlife populations. Our multi-disciplinary wildlife disease work investigates why and how wildlife pathogen transmission is influenced by alterations in land use or natural resource extraction, nutritional resource availability, population structure, host and pathogen life history characteristics, host behavior and immunity, co-infections, and intra and interspecific interactions. 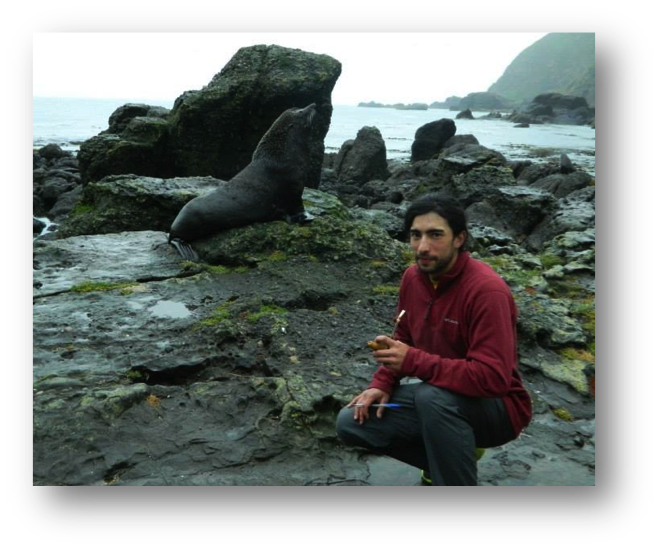 Study systems include hookworm infection of South American Fur Seals, pathogens of feral cats in Seoul, Korea, raccoon populations in the Southeastern US (distemper spatiotemporal dynamics and hemotropic mycoplasma infection), fibropapillomavirus in sea turtles, marine mammal diagnostic pathology in collaboration with the North Slope Borough Department of Wildlife Management in Barrow, Alaska, and contributing to marine mammal diagnostic pathology in collaboration with the Georgia Department of Natural Resources. Additionally, our research on domestic dog health in La Chorrera district in Panama has significant implications for wild carnivore health and conservation in BCNM and Soberania National Park. In this study (Fung et al. 2014. Acta Tropica), we found a high seroprevalence of canine distemper as well as other generalist pathogens in domestic dogs in rural communities living close to protected areas (Gigante). These pathogens pose a significant health risk to the health of wild carnivores in this region. 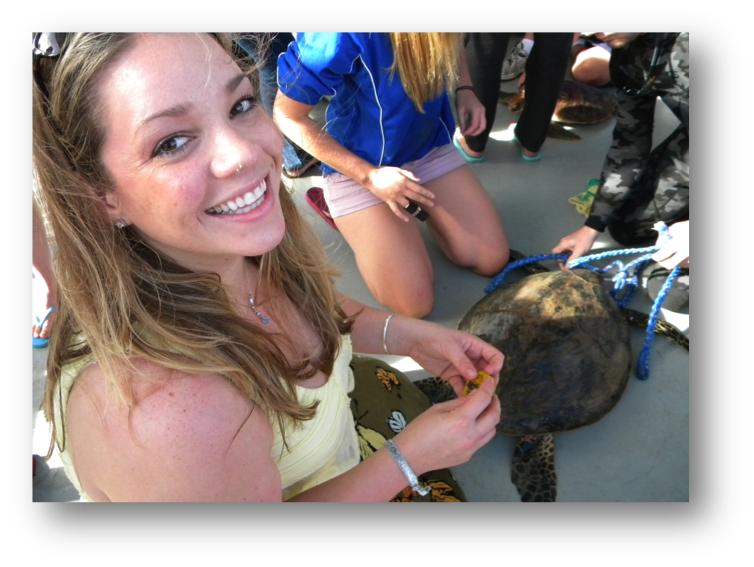 Dr. Annie Page-Karjian samples fibropapilloma and skin biopsy tissues from a wild-caught green sea turtle in Queensland, Australia. 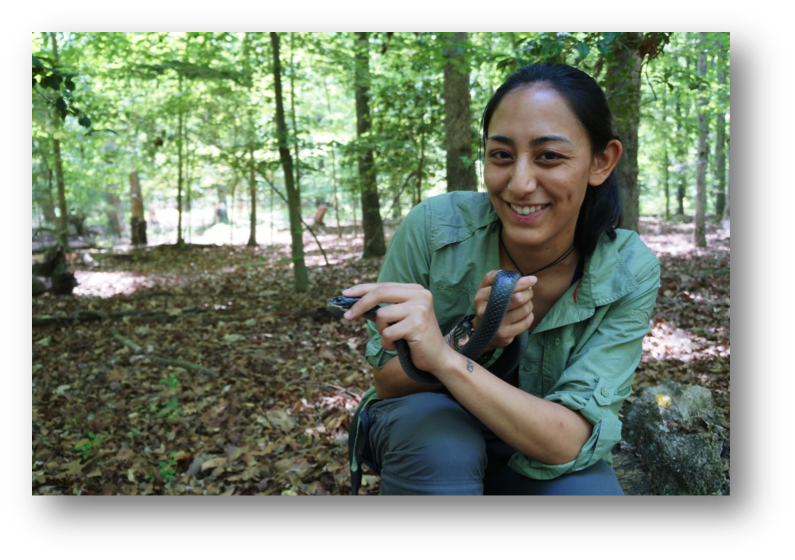 Christina Varian's research focuses on infectious disease dynamics in wildlife communities in response to anthropogenic land use change.